Kate Bush - 50 Words for Snow. Vinyl LP. Bleep. 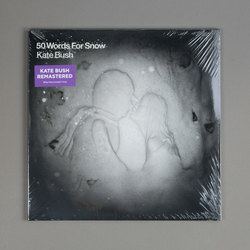 50 Words For Snow, the tenth studio album from the peerless Kate Bush, gets reissued just in time for the Winter solstice. Though not as well-known as her all-conquering ‘80s output, 50 Words For Snow is a late-period masterpiece from the art-pop auteur. Backed by a chamber jazz ensemble who treat her arrangements with a deft touch, here Bush works through intimate songs that take in ye-ye, post-rock and the post-jazz sound of groups like Portico Quartet. Cuts like ‘Snowed In At Wheeler Street’ bring back some of the old bombast.